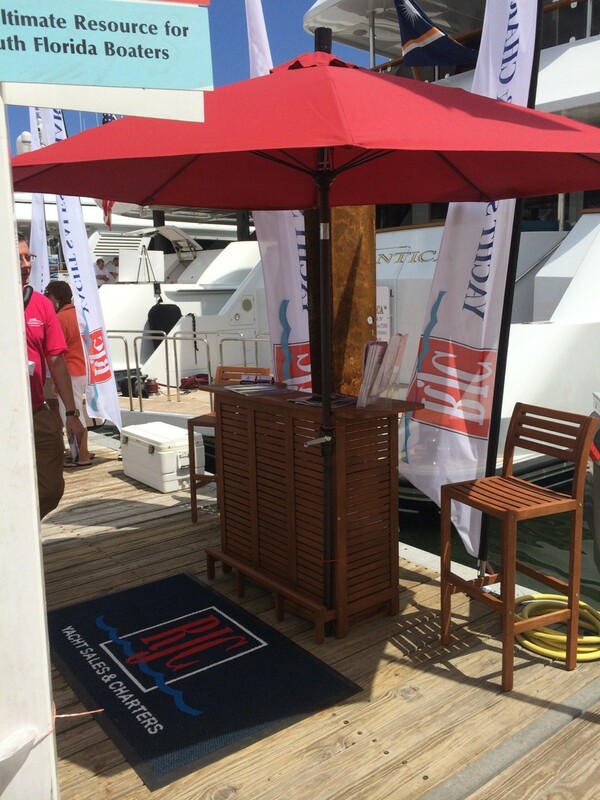 RJC Yacht Sales & Charter are featuring the 135′ Christensen M/Y ATLANTICA in the Palm Beach Boat Show this weekend! RJC Yacht Sales & Charter is proud to be featuring the 135′ Christensen Tri-Deck Motoryacht, ATLANTICA in the Palm Beach Boat Show for sale and charter! ATLANTICA is position in slip 653 on ramp 6 through the course of the show. Please stop by and visit our booth to sign-in and inspect M/Y ATLANTICA. 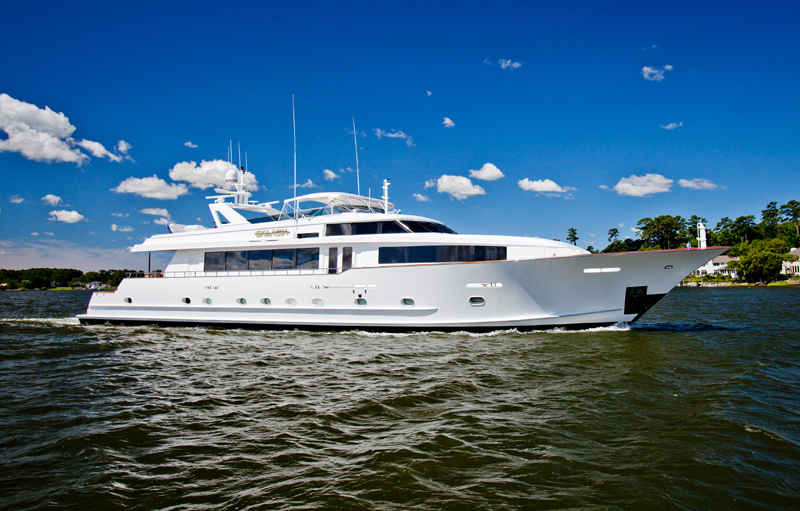 The stylish 135′ motor yacht Atlantica is currently available for charters in the Bahamas and Florida. Atlantica was launched in 2000 by Christensen and is offered on the global charter market. She offers 12 guests accommodation across five beautifully appointed cabins with private ensuite luxurious bathroom complete with amenities and personal entertainment systems. Her interior, designed by Donald Starkey resembles a grand members club complete with plush sofas; scatter cushions and rugs, also incorporating a great entertainment system. For those who enjoy being outside, her deck space offers ample alfresco space. From dining on the aft deck to a light lunch around the Jacuzzi, sunbathing on the loungers or an afternoon tea. The fantastic weather and clear turquoise seas of The Bahamas, it is little wonder that guests enjoy being in the water – Atlantica carries with her a variety of water toys including Sea bobs and fishing gear, plus a tender to enable her captain to ferry the guests in and out of smaller bays. Atlantica has proved a very popular charter yacht with her fantastic layout and the ambiance the professional and friendly crew create. Charter Atlantica in the Bahamas or Florida from now until May with RJC. Rates begin at $105,000 per week. 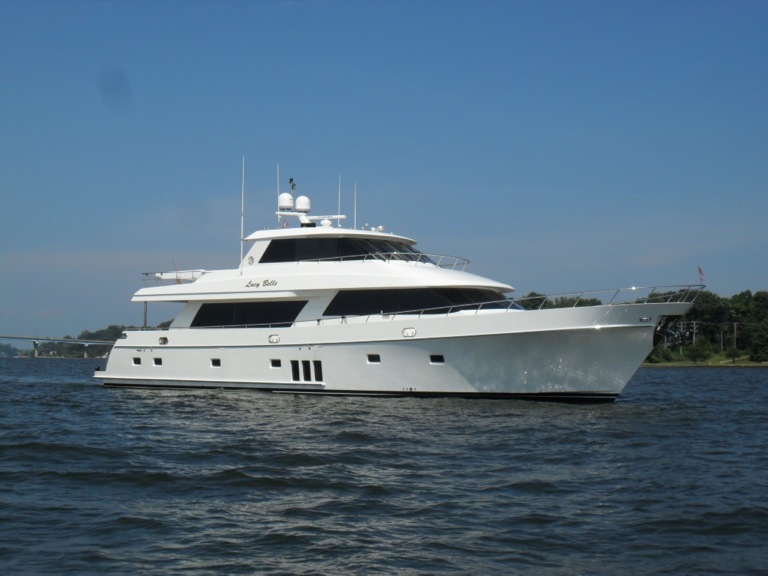 Raymond Young just recently closed on the sale of the 2012 90′ Ocean Alexander motor yacht Lucy Belle. She is a virtually new vessel with only 525 original hours on her twin MTU 10V 2000 engines. Additional features include zero-speed stabilizers, upgraded 55KW Kohler gensets, ABT bow and stern thrusters and a Jacuzzi on the bridge. She also features a custom interior with Sapele joinery throughout along with marble and granite highlights. A four-stateroom layout along with separate crew quarters aft provide accommodation for eight guests and three crew. The guest staterooms are laid out as a master suite, VIP stateroom and two twins. All have full ensuite bathroom facilities. Lucy Belle was asking $5,995,000. 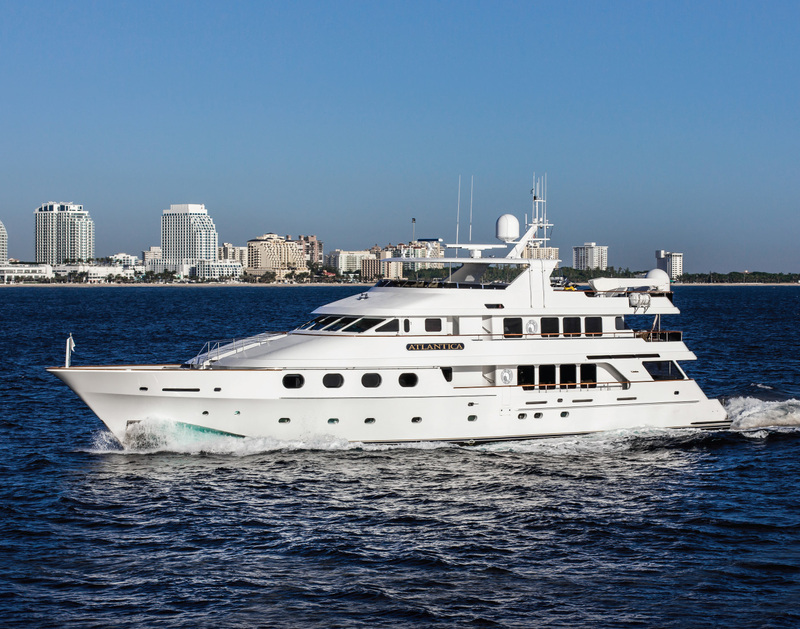 I just wanted to let you know that Raymond Young in our office just listed the 1997 / 2012 115′ Broward CMY, SALACIA for sale. She represents one of the most highly customized wide beam Browards ever built and features rare full walkaround decks and sports cockpit. SALACIA went through a total refit in 2012 to include high style contemporary interior with all new soft goods and totally restyled flybridge to include new teak decking, comfortable seating, and oversized jacuzzi. Her four stateroom layout features a full width king master with marble his & her bath, two queen guest staterooms, and one twin all with ensuite heads and entertainment. Powered by DDEC 16V92’s which were rebuilt last year she features all of the large yacht options to include 55Kw Northern Light generators, stabilizers, bow thruster, watermaker, tender & (2) waverunners. 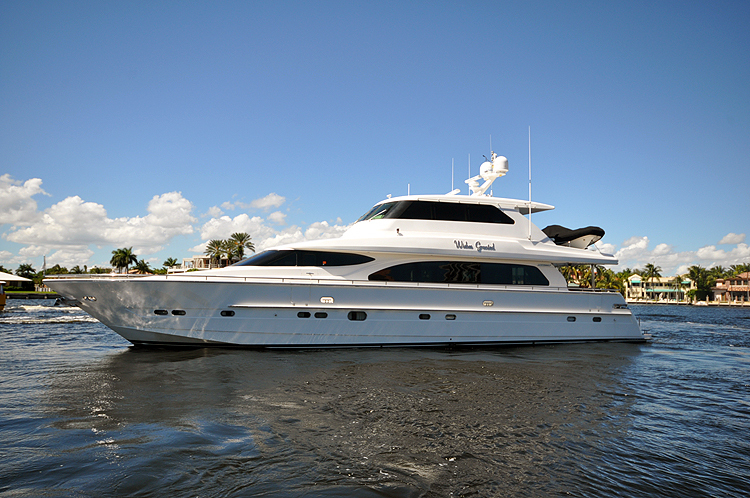 Currently located at Pier 66 in Ft. Lauderdale her asking price is $2.995m. Please contact our office or the listing broker, Raymond Young, for additional information or for showing details. RJC Yacht Sales & Charter – M/Y RELENTLESS available for spring charters! The 145’ motor yacht RELENTLESS is available this Spring for charter in the Caribbean during March and April 2014. RELENTLESS features a warm interior with traditional woodwork, original art work, and exquisite Murano crystal throughout the yacht. Deck spaces on this large yacht are extensive and offer several separate areas for alfresco entertainment including an aft deck with seating for ten guests. The sun deck is designed as a multi-purpose area with chaise lounges, wet bar, jacuzzi, and exercise equipment. Accommodations are for ten guests in five staterooms to include a master suite with a king size bed, two double staterooms with king size beds, third double with a queen bed, and one twin cabin. All staterooms have entertainment centers and ensuite bathrooms. RELENTLESS has WiFi internet access throughout, a DVD library, and satellite television. Toys on RELENTLESS include a Novurania tender, two Waverunners, water skis, snorkeling gear and fishing tackle. WISHES GRANTED accommodates (6) guests in (3) staterooms with ribbon cut American Cherry & Burle Maple Wood joinery interior, and her layout includes comfortable salon, gourmet galley, spacious aft deck and enclosed skylounge. Additional options include TRAC stabilizers, Twin Northern Light 32Kw Gens, Bow/Stern thrusters, and watermaker. Powered by twin CAT C30’s (1,550hp) engines giving her a cruising speed of 17 knots and a max speed of 21 knots. In January 2014 WISHES GRANTED received a new bottom job and stabilizer seals. The vessel is conveniently located in central Fort Lauderdale and is available at any time for immediate and easy inspection. Please contact Bob Cury for more information.